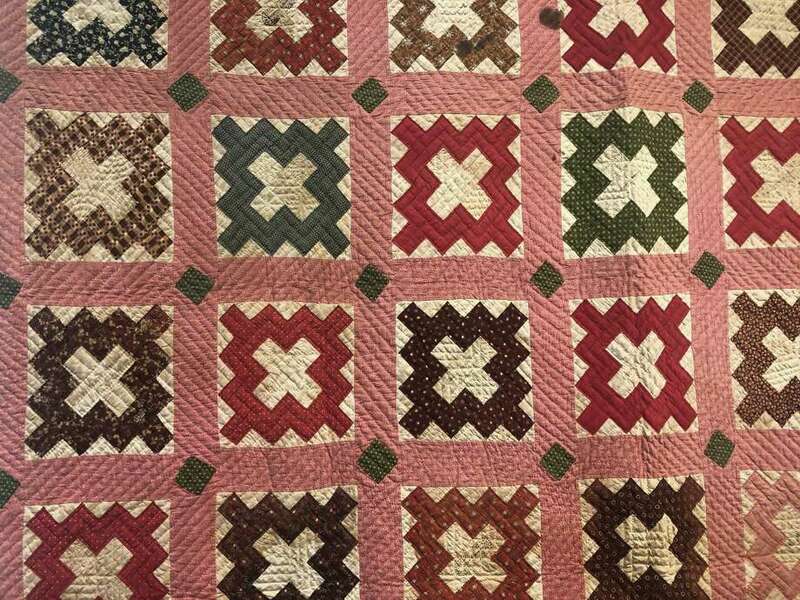 Signature quilts, or friendship quilts, were cherished mementos for women who moved away from their families and friends upon marriage or (particularly during the 1800s) westward migration. People would create the quilt blocks and sign their names in indelible ink, or embroider their names with thread. Sometimes one person with beautiful handwriting was chosen to inscribe all of the signatures. Unlike most anonymous historical quilts, signature quilts are treasure troves for researchers piecing together the past. One of the quilts on display in the Fairfield Museum’s newest exhibition, “Make Your Mark,” was passed down in the Lacey family of Fairfield. It was gifted to the Museum by Robert Lacey and was created circa 1840. The quilt is signed by about 60 women and a few men from Fairfield, Trumbull and other nearby towns. It was likely cherished by its recipient, as it would have reminded her of the time when she lived with family and friends. “Make Your Mark” explores mark-making in art and in crafts and also talks about the importance of signatures throughout history. The word “signature” comes from the Latin word meaning to “sign, seal or mark.” Signing one’s name is routine, yet it is also unique and powerful. A signed name can grant permission, determine ownership, acknowledge and accept. Signatures can guarantee authenticity or legitimize a deal. A signature can change lives and even the course of history. In the past, even having a signature was a form of privilege, reflecting the social power that those who were taught to write could wield. Not being allowed or able to sign one’s name marked the absence of power. The Fairfield Museum & History Center and Museum Shop, located at 370 Beach Road, is open seven days a week, 10 a.m.-4 p.m. Members of the Museum and children under 5 are admitted free. For more information, call 203-259-1598 or visit Fairfieldhistory.org.